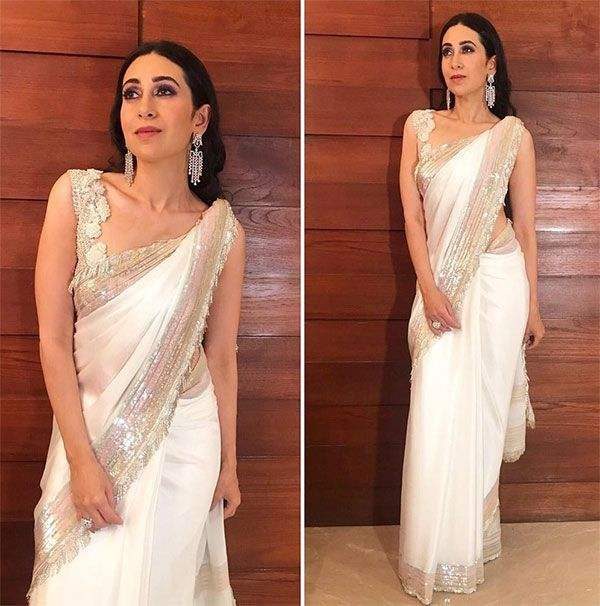 Karisma Kapoor, the first woman from the Kapoor khandaan to step into the glamorous world, was the ultimate queen of 90’s. She was merely 18 years old when she stepped into Bollywood with Prem Quadi in 1991, fighting against all the odds. From essaying an innocent wife in Biwi No 1 to playing the character of a joyful bubbly girl in Dulhan Hum Le Jayenge, Karisma has proved her versatility time and again on the big screen. Be it Andaaz Apna Apna, Haseena Maan Jaayegi or her other films, she was just so effortless and natural on screen. Not only that, her phenomenal dancing skills took the songs Oonchi Hai Building, Tan Tana Tan, Sona Kitna Sona Hai, up by a notch making them chartbusters. Karisma, who is also addressed as Lolo by her fans, has always managed to put her best fashion foot forward. Give her any attire and she would show you how to rock it with much ease. Her style is always amongst everyone’s top-ranked. While professionally we don’t get to see much of her, she never fails to stun us with her gorgeous social appearances. And when it comes to ethnic fashion, she never fails to give us outfit goals. From her anarkali suits to saris with a twist, the fashionista is an encyclopedia of ethnic looks. Whoever said ‘once a diva, always a diva’ wasn’t so wrong after all. So, as Karisma turns a year older, let’s take a look into oh-so-gorgeous actress’ traditional game, which is always on point. 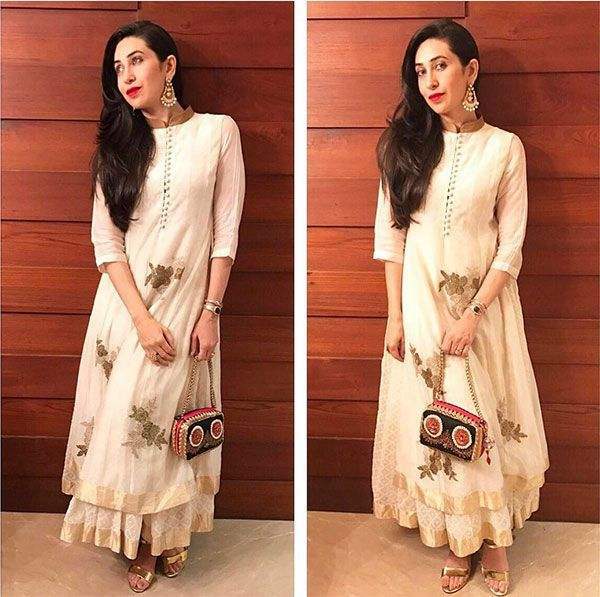 Keeping things simple yet classy is Karisma’s forte. Sporting a Forest green regal high neck blouse with a contrasting floral printed lehenga and laced dupatta, she made every heart stop for a while at the Sonam Kapoor-Anand Ahuja wedding. Keeping it easy with the accessories department, this embellished grey lehenga is giving us ethnic wear envy like never before. And Lolo wearing it is obviously making it look 10x better! Her love for white colour is so evident. Wearing a white Myoho ensemble with Jimmy Choo sandals and jewellery from Jet Gems, it won’t be wrong to call her one of the front-runners of ethnic fashion. Oh, and we are eyeing the owl purse. This classic white saree by Manish Malhotra she opted for Sonam’s wedding reception is making her look like she’s still in her 20’s. With a beautiful face, an infectious smile and her well-maintained figure, she is looking ethereal as ever. She wore this monotone dove-grey sari by Kiran Uttam Ghosh at the launch of Jimmy Choo’s festive Diwali collection. Do we need to say more? She looked every bit of gorgeous and we still can’t stop drooling! Even having stayed away from the silver screen these past few years, she’ll never stop ruling our hearts. Previous story Will Ibrahim follow sister Sara Ali Khan’s footsteps?